We offer 12 spacious and luxurious tents, bordering the Masai Mara National reserve, hidden away under thatched roofs on a lush peninsula in the Talek River, with spectacular views of the Savannah. You will have your own veranda overlooking the river, and the bathroom en-suite with a hot solar heated shower open to the sky. Enjoy the amazing wildlife from the comfort of your tent, the fig-tree platform, or while lazing over a drink in the open-air bar. 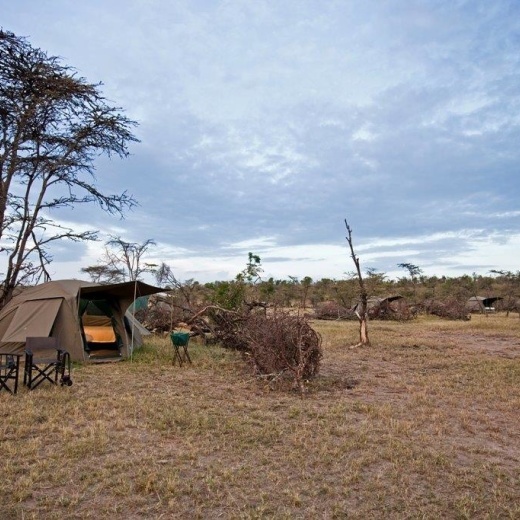 Enjoy game viewing while wining and dining right from the comfort and convenience of your dining table set within the grounds of this camp. Support community initiatives by visiting the Maasai 'Mamas' where the talented women from the community develop Fair-trade beaded and leather merchandise under the 'Basecamp Mara Brand'. Basecamp Masai Mara provides 12 spacious and luxurious tents, bordering the Masai Mara National reserve, hidden away under thatched roofs on a lush peninsula in the Talek River, with spectacular views of the savannah. You will have your own veranda overlooking the river, and the bathroom ensuite with a hot solar heated shower open to the sky. Enjoy the amazing wildlife from the comfort of your tent, the fig-tree platform, or while lazing over a drink in the open-air bar. Meals at Mara Basecamp Masai Mara can be enjoyed outdoors or in the thatched dining area. Dine on traditional local fare, as well as international cuisine. Stay at Kenya’s most legendary safari camp, Basecamp Masai Mara, preferred by politicians and dignitaries because of the camp’s commitment to fight climate change, to nature conservation and local development. Leave a positive footprint and enjoy Basecamp’s specialty, walking safari with your own Masai guides, or you can enjoy traditional game drives in classic safari jeeps on the open savannah of Masai Mara.